Two Swing classes support styled text: JEditorPane and its subclass JTextPane. The JEditorPane class is the foundation for Swing's styled text components and provides a mechanism through which you can add support for custom text formats. If you want unstyled text, use a text area instead. You can see an editor pane and a text pane in use by running TextSamplerDemo. Here is a picture of the TextSamplerDemo example. Click the Launch button to run TextSamplerDemo using Java™ Web Start (download JDK 7 or later). Alternatively, to compile and run the example yourself, consult the example index. The TextSamplerDemo example barely begins to demonstrate the capabilities of editor panes and text panes. However, the top right editor pane illustrates a handy, easy-to-use feature: it displays uneditable help information loaded from a URL. The text pane at the lower right demonstrates that you can easily embed images and even components directly into text panes. If you need a fully-fledged help system, take a look at the javahelp project. The Swing text API is powerful and immense, and we could devote an entire book just to using editor panes and text panes. This section introduces their capabilities, offers hints on which one you might want to use, and points to other sources of information. One task that you can accomplish without knowing anything about the Swing text system is displaying text from a URL. Here is the code from TextSamplerDemo.java that creates an uneditable editor pane that displays text formatted with HTML tags. //Put the editor pane in a scroll pane. The code uses the default constructor to create the editor pane, then calls setEditable(false) so the user cannot edit the text. Next, the code creates the URL object, and calls the setPage method with it. The setPage method opens the resource pointed to by the URL and figures out the format of the text (which is HTML in the example). If the text format is known, the editor pane initializes itself with the text found at the URL. A standard editor pane can understand plain text, HTML, and RTF. Note that the page might be loaded asynchronously, which keeps the GUI responsive but means that you should not count on the data being completely loaded after the call to setPage returns. In order to use editor panes and text panes, you need to understand the text system, which is described in Text Component Features. Several facts about editor panes and text panes are scattered throughout that section. Here we list the facts again and provide a bit more detail. The information here should help you understand the differences between editor panes and text panes, and when to use which. An editor pane or a text pane can easily be loaded with text from a URL using the setPage method. The JEditorPane class also provides constructors that let you initialize an editor pane from a URL. The JTextPane class has no such constructors. See Using an Editor Pane to Display Text From a URL for an example that uses this feature to load an uneditable editor pane with HTML-formatted text. Be aware that the document and editor kit might change when using the setPage method. For example, if an editor pane contains plain text (the default), and you load it with HTML, the document will change to an HTMLDocument instance and the editor kit will change to an HTMLEditorKit instance. If your program uses the setPage method, make sure you adjust your code for possible changes to the pane's document and editor kit instances (re-register document listeners on the new document, and so on). Editor panes, by default, know how to read, write, and edit plain, HTML, and RTF text. Text panes inherit this capability but impose certain limitations. A text pane insists that its document implement the StyledDocument interface. HTMLDocument and RTFDocument are both StyledDocuments so HTML and RTF work as expected within a text pane. If you load a text pane with plain text though, the text pane's document is not a PlainDocument as you might expect, but a DefaultStyledDocument. To support a custom text format, implement an editor kit that can read, write, and edit text of that format. Then call the registerEditorKitForContentType method to register your kit with the JEditorPane class. By registering an editor kit in this way, all editor panes and text panes in your program will be able to read, write, and edit the new format. However, if the new editor kit is not a StyledEditorKit, text panes will not support the new format. As mentioned previously, a text pane requires its document to implement the StyledDocument interface. The Swing text package provides a default implementation of this interface, DefaultStyledDocument, which is the document that text panes use by default. A text pane also requires that its editor kit be an instance of a StyledEditorKit (or a subclass). Be aware that the read and write methods for StyleEditorKit work with plain text. Through their styled document and styled editor kit, text panes provide support for named styles and logical styles. The JTextPane class itself contains many methods for working with styles that simply call methods in its document or editor kit. Through the API provided in the JTextPane class, you can embed images and components in a text pane. You can embed images in an editor pane, too, but only by including the images in an HTML or RTF file. Here is the code from the TextSamplerDemo example that creates and initializes a text pane. //Load the text pane with styled text. Briefly, this code hard-codes the initial text into an array and creates and hard-codes several styles  objects that represent different paragraph and character formats  into another array. Next, the code loops over the arrays, inserts the text into the text pane, and specifies the style to use for the inserted text. Although this is an interesting example that concisely demonstrates several features of JTextPane, "real-world" programs aren't likely to initialize a text pane this way. Instead, a program would use an editor pane to save a document which would then be used to initialize the text pane. This section lists some of the API related to text and editor panes. Many of the most useful methods for JEditorPane and its subclass JTextPane are inherited from the JTextComponent class. You can find the API tables for JTextComponent in The Text Component API. Also see The JComponent Class, which describes the API inherited from JComponent. JEditorPane(String) Creates an editor pane loaded with the text at the specified URL. setPage(String) Loads an editor pane (or text pane) with the text at the specified URL. URL getPage() Gets the URL for the editor pane's (or text pane's) current page. JTextPane(StyledDocument) Creates a text pane. The optional argument specifies the text pane's model. setStyledDocument(StyledDocument) Gets or sets the text pane's model. To begin using text, you might want to run these programs and examine their code to find something similar to what you want to do. TextSamplerDemo Using Text Components Uses each Swing text component. 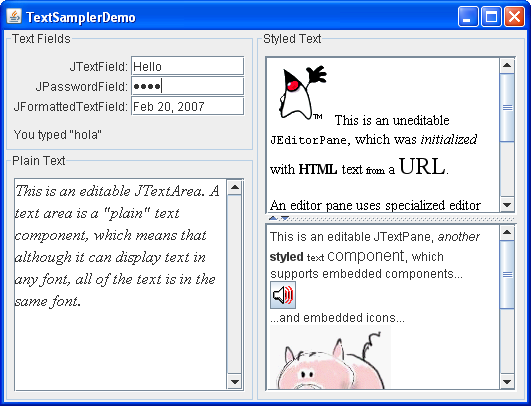 TextComponentDemo Text Component Features Provides a customized text pane. Illustrates many text component features, such as undo and redo, document filters, document listeners, caret change listeners, and how to associate editing actions with menus and key strokes. TreeDemo How to Use Trees Uses an editor pane to display help loaded from an HTML file. Learn to edit HTML text in JavaFX with the Using JavaFX UI Controls: HTML Editor tutorial.